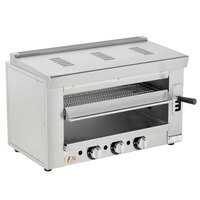 A salamander broiler allows you to brown the tops of casseroles, melt cheese, or re-heat precooked foods. 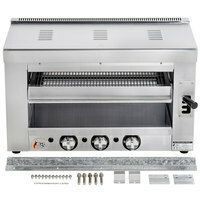 These products have a heating element above the food that creates a high temperature that is ideal for adding finishing touches to your dishes. 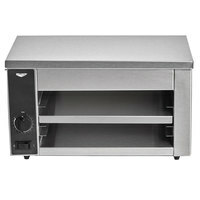 Additionally, you can use a cheese melter to warm plates, melt cheese on your nachos, or toast garlic bread before serving it to your guests. 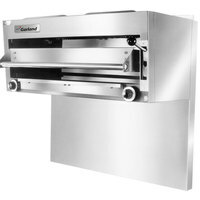 Many of these salamander broilers are designed to retain heat while on standby, so you can quickly fire up the broiler for last-minute use, rather than waiting for the unit to completely re-heat. 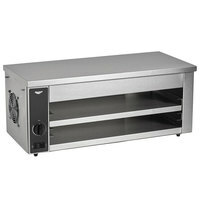 In addition, easy-to-load racks accommodate a variety of dish sizes for maximum versatility. 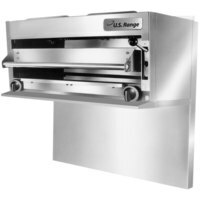 If you're looking for a salamander and range combination, you can find a unit that will attach to your existing range, or one that mounts on a wall or countertop to best suit your needs. 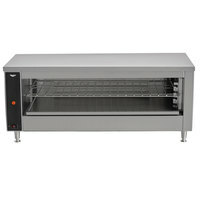 <h2>What Is the Difference Between Salamanders and Cheese Melters?</h2> Salamanders create a high heat that can be used to broil salmon, heat steaks, brown the tops of casseroles, or melt cheese. 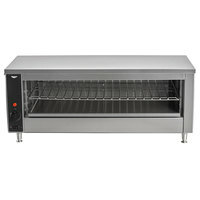 Where salamanders can cook foods, cheese melters can only be used to melt cheese, toast bread, and keep plates warm. 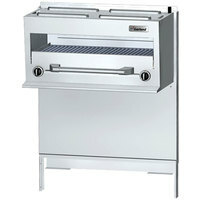 Salamanders are typically used in medium- and high-volume settings, whereas cheese melters are better for light-duty use in cafes and small bistros.